Indian Information Services (IIS) officer Sitanshu Ranjan Kar has taken over as the Director General of Press Information Bureau (PIB). He has replaced Frank Noronha as the DG of PIB. Frank Noronha superannuated on 30th April 2018. 1983-batch IIS officer, who has served at key positions in various media units of the Ministry of Information and Broadcasting viz. All India Radio (AIR) and Doordarshan. Mr Kar joined the Press Information Bureau in 2003. 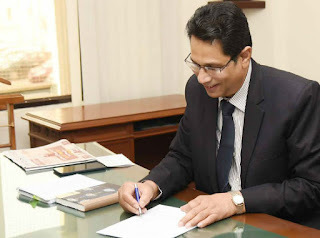 He took over as the 27th Principal Spokesperson of the Government of India. He was the longest-serving spokesperson of the Ministry of Defence for over a decade at a stretch. Question 1. Who is appointed as the new Director General (DG) of PIB (Press Information Bureau)? Question 2. Who was earlier holding the position as a DG in PIB? Question 3. Where are the headquarters of PIB located?